This Size has been discontinued. The power of Suspend has now improved! Suspend Polyzone features a proprietary polymer layer that protects the active ingredient from weather, irrigation and mechanical abrasion. This controlled release formulation, which resists erosion, ensures your treatment will continue to control targeted pests for up to 90 days outdoors. It also stays right where you put it, so if you want to increase the effectiveness of your treatments, put the science of Suspend Polyzone to work for you. 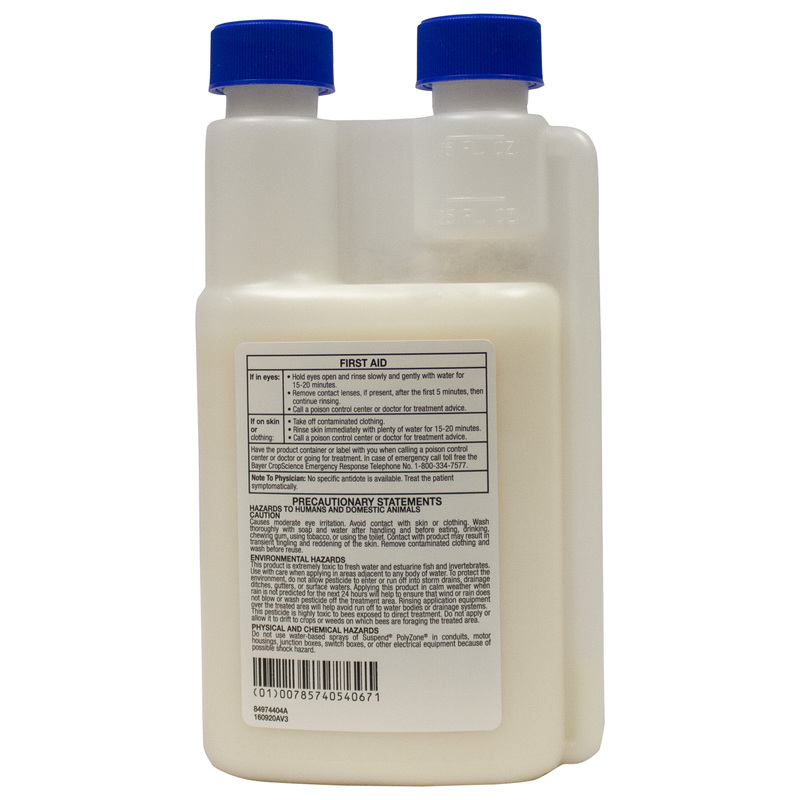 NOTE: New bottles with BLUE CAPS - Suspend PolyZone is now approved for Commercial Food Handling Areas. The newly expanded label includes food handling area applications. The long-lasting residual formulation controls common pests such as flies, ants, roaches - even in wet, warm and greasy environments. Use it in conjection with Maxforce baits for a comprehensive approach in commercial kitchens and food handling facilities. 0.23 - 1.50 oz. per gallon of water per 1,000 sq. ft. I Bought this and the 1 gal. mixing jug last April. My wife and I bought our house in 2007 and after removing the exterior brush - Found we had a termite problem, a stink bug problem, spider issues along with ants and yellow jackets galore. My wife was so disgusted and grossed out, she almost left! So we got a service that said they would take care of everything "don't worry; if you have an emergency, we'll be right over - all included, and you will never see a bug in your home again!" That was a bunch of lies and a big waste of money. I found DMOPC one night when I was just about to give up - and thought the Suspend Polyzone was less expensive than the useless service that didn't work, so I had nothing to lose, right? Well we gained, peace of mind and I re-gained a happy wife. We went from having swarms of stink bugs crawling up the exterior walls and spent too much time catching the ones that got in the house - to, now only seeing a few here or there outside; and maybe one or two live ones as well as many more dead ones inside the house. Now, when the spiders and ants begin to reappear we know it is time to do another spraying (so far that has been every 6 months). As for the yellow jackets - well they just don't like our house as much anymore, especially when we find and spray down a nest during treatment, they crawl out of the nest and die immediately. As for termites we haven't seen a mud trail since, and we still have the bait/test stations left by the previous service - and haven't seen any new activity since we have been doing our own pest control spraying the Suspend Polyzone! Following the instructions and mixing in the recommended one gallon spray jug goes a long way to treat both the interior and exterior of our oversized cape. The one pint of Suspend Polyzone is just at the half way point and should last for another year. Do the math - so called professional service cost nearly $1,000 per year versus $100.00 to do two years of DMOPC this way(if you don't buy the recommended jug it is less than $50.00 for 2 years). So happy to have realized we are saving close to $2000.00! Can't beat that! 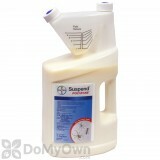 i think bayer finally got it right with suspend polyzone. i didn't have much faith in or success with the original formula, but adding the polymer seems to be working as good as advertised. 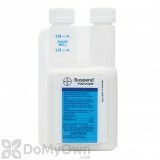 i even understand bayer's looking into adding this polymer to some of their other sc products. well done! This is the only product that I've used so far that really does kill stink bugs. When I first used it I didn't think it worked so I called DoMyOwnPestControl and asked them why it wasn't getting rid of the bugs. I told them that I sprayed it right on some of the bugs and they didn't fall down. They told me that it didn't knock them down instantly but they assured me that it does work. Here it is two weeks later, all I can say is that IT REALLY DOES WORK. Yes there are very few stink bugs coming around and they don't seem to stay very long. I also find dead ones laying around the house. And it is residual. I sprayed two weeks ago and they are still dropping like all over the place. And a PS here - DMOPC is a great company to deal with. Received this 3 days after ordering. Mixed using .75 ounce per gallon and sprayed the inside and outside of my pole barn where I had a ton of spiders and other bugs. The next morning when I went out there were dead bugs everywhere! It's been 10 days and I have not seen a bug since. If this truly lasts for 3 months I'll be extremely happy. I'll try and update this after 90 days to give to give a review of the lasting effects. this is even better than the original suspend sc! i have not seen a scorpion in my home in months using the original.i thought to try the suspend as i live on the bottom of a mountain and scorpions like it hot on the rocks and i also should mention i live in arizona! love it here,but no way can i handle scorpions! now when it rains(rarely)the product sticks and i sleep so much better.i had the bug people,but they trick you so they can still charge you lots!well i can do this myself thanks to " do my own pest control!" i have a condo so i have told all my friends" GO BUY THIS NOW! "everyone wants to know the secret...so the word is spreading fast here in the desert.everyone wants a sample spray from me.the price is reasonable and i just want everyone to know that this product used as directed REALLY WORKS! thanks to "do my own pest control.com. "go buy it today! Whats the difference in Suspend SC & Polyzone? While both products do share the same active ingredient their formulations are very different. Suspend SC will only last for about 30 days outdoors (90 days indoors) while Suspend Polyzone has been tested and will last for 90 days outdoors. Suspend Polyzone has a unique poly coating over the particles of the product which protects it from weathering and makes the residual last longer. Suspend Polyzone was also designed to stay up on the surface of even very porous areas such as concrete or wood which makes the product more available to insects. Is Suspend Polyzone safe to use in homes with pets? Suspend Polyzone is safe in homes that have children and pets if used as directed on the product label. They should not be in the treated area during application and when the surfaces are wet. They can re-enter when completely dried. What is the best exterior spray that you can use to keep insects off your house for the longest period? 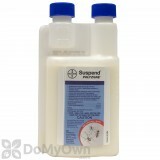 Our most popular product that has the longest residual is called Suspend Polyzone. It lasts longer than most products, about 90 days indoors and outdoors. This is because it has a polymer technology that ensures the active ingredient stays where it’s applied after drying and protects it from weather, irrigation and mechanical interference. Can you use Suspend Polyzone inside your home? I have been using Suspend SC inside my home but I ran out. can I use the Polyzone inside my home? Yes, Suspend Polyzone can be used indoors as well as outdoors. The only difference between the two products is that the Polyzone is formulated differently to hold up longer to the outdoor elements. Will Suspend Polyzone kill stink bugs? Apply Suspend Polyzone outdoors on all door frames, window frames, areas where utilities (cables, pipes, wires) enter into the structure, a band of soil 6 to 10 feet adjacent to the structure, also to a height of 2 to 3 feet on the foundation where pests may be active or may find entrance. As the stink bugs crawl over the treated area, they will receive a lethal does of the insecticide and usually die within a few hours. You should treat every month starting in August and ending in November for best results. Stinkbugs are usually not a problem for most people until fall when they start looking for a nice warm place to spend the winter.